He ushered in the rock'n'roll era in Britain and he was the King of Skiffle. He influenced an entire generation of musicians as his hit Rock Island Line inspired them to pick up guitars. He was, to all intents and purposes, the biggest British star of the 1950s. 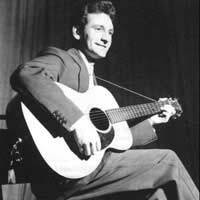 So many people know the name Lonnie Donegan - but how many know anything about the man? He wasn't born Lonnie - that's a name he adopted later (acquired from bluesman Lonnie Johnson by a mix up). Nor was he English - he came into the world in Glasgow in 1931, the son of a violinist, although his father discouraged him from playing. But music was in his blood and Anthony James Donegan eventually bought himself a guitar once the family moved to London. It wasn't until after World War II that he began hearing occasional folk and blues music on the radio and became one of the few playing it. That led to an invitation by jazz man Chris Barber to join his band on banjo - an instrument Donegan had never played, although he suddenly found himself learning. National Service called in 1949, and once he was discharged, he found a source for the music he loved in the library at the American Embassy in London. He rejoined Barber's group, which was taken over by another jazz man, Ken Colyer, who'd introduced the "skiffle" spots into the band's set. The hyped-up folk-blues of skiffle proved popular live and after Barber and Donegan had sheared away from Colyer's group, they kept it in their sets, even recording two of them, Rock Island Line and John Henry or the 1954 New Orleans Joys LP. The album sold an unbelievable 50,000 copies, which prompted the record label to issue Rock Island Line as a single. It spent eight months on the charts (even cracking the Top 20 in America), moving an unprecedented three million copies. Donegan received a £50 session fee - but no royalties. Donegan was a true star and had an influence on every teenager who went out and bought a guitar to play skiffle himself. He went solo, signing with Pye Records and followed his initial success with Lost John in 1956 and his first LP, Showcase. Although skiffle's popularity faded sharply after 1958, Donegan's Midas touch remained for a few years, giving him a total of 34 chart hits in Britain, including revivals of old music hall material like My Old Man's A Dustman. For the most part though, he stuck to the style that had made him (and that he truly loved), adapting American blues and folk music. He turned to producing other artists, but enjoyed a brief 1978 revival with the LP Putting On The Style, where he was joined by many of those he'd influenced. He experienced another revival in the late 1990s, when his star rose after making a skiffle album with singer Van Morrison. He had a history of heart problems in later life, suffering a couple of heart attacks and it was his heart that eventually killed him in November 2002. His funeral was attended by hundreds of musicians, showing how strong his influence remains as the pioneer of British rock'n'roll.